Many small businesses have realized the need to include content creation strategies into their online marketing campaigns. While creating original content can be a great boost for SEO and help to develop a brand identity, sharing others content can also assist with online marketing efforts. It can be particularly helpful for businesses just starting out in the online marketing game. 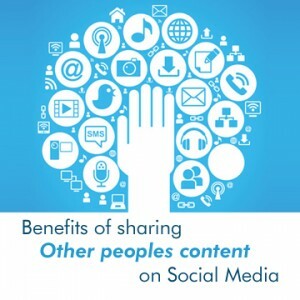 Here are a couple of reasons you should incorporate sharing others content into your marketing strategies. Prevents being labeled as a spammer. Businesses that only ever share their own content may be perceived as a spammer. That is the last thing you want, in social media spammers are ignored, looked down on and if reported it could cause trouble for your account. Sharing others content shows that your interest is not just in selling everybody on your business. Boost your visibility and credibility. Sharing content from established authorities in your community can contribute to your reputation as a trusted filter for content. By sharing their content you can show that you are up to date with trends in the industry and trust in accepted experts information. Also it could put you on the page owners radar when they are alerted to your sharing of their posts. Sharing others content is a great way to start engaging in a community. Trust building and forming relationships with your audience comes when you provide them with engaging content, whether you created or not. Also it’s a great first step to engaging with the influencers of your community. Sharing their content is a way to show appreciation for their work and can create goodwill within the community towards you. Building these relationships with your audience and other industry professionals can definitely give your social media posts a boost when you share your own original content.